Weston Bi Metallica Thermometers - Model 4130 | Texas Valves & Instruments, LLC. 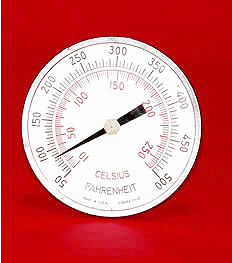 Note: Model 4130 can be recalibrated by means of an external adjustment by firmly holding the head and immersing the stem at least 2" in an agitated known controlled temperature bath and turning the hex nut at the base of the thermometer head until the pointer indicates the correct temperature. Note: For correct indications, the stem should be immersed at least 2" in liquids and 4" in gases. Maximum head temperature 220°F (104°C) with plastic window.